Virgin is a leading international investment group and one of the world's most recognised and respected brands. Conceived in 1970 by Sir Richard Branson, the Virgin Group has gone on to grow successful businesses in sectors including mobile telephony, travel & transportation, financial services, leisure & entertainment and health & wellness. Established for more than 20 years, Kaspersky Lab is a renowned global cybersecurity company. Kaspersky Lab’s deep threat intelligence and security expertise is constantly transforming into security solutions and services to protect businesses, critical infrastructure, governments and consumers around the globe. The company’s comprehensive security portfolio includes leading endpoint protection and a number of specialised security solutions and services to fight sophisticated and evolving digital threats. Over 400 million users are protected by Kaspersky Lab technologies as well as 270,000 corporate clients. Kaspersky Lab is uniquely placed to protect Envision Virgin Racing’s technology and keep the team ahead of the competition. It is also at the forefront of developing cutting-edge technologies to keep connected and autonomous vehicles secured against cyber threats. Genpact is a global professional services firm that makes business transformation real. We drive digital-led innovation and digitally-enabled intelligent operations for our clients, guided by our experience running thousands of processes for hundreds of Global Fortune 500 companies. From New York to New Delhi and more than 20 countries in between, Genpact has the expertise to connect every dot, reimagine every process, and reinvent how companies work. 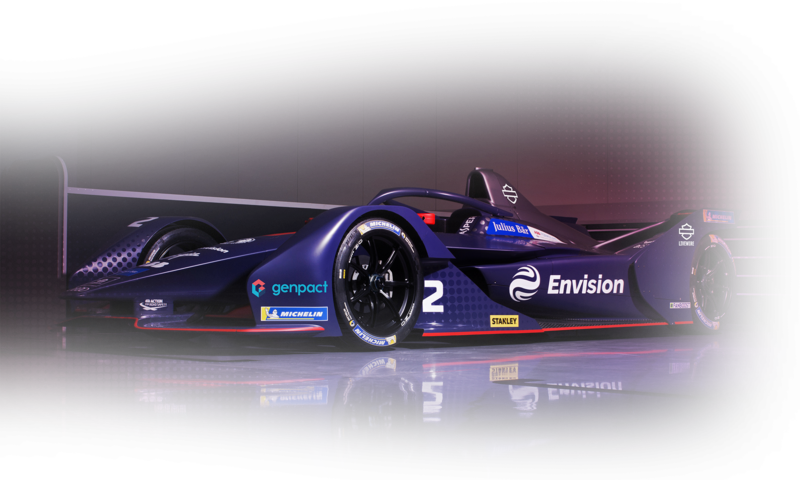 In a race where milliseconds separate the winners from the rest, Genpact and Envision Virgin Racing are enhancing the team’s data and insights to strengthen strategy and boost performance. Stanley Black & Decker, an S&P 500 and FORTUNE 500 company, is the world’s leading provider of tools and storage, the world’s second-largest commercial electronic security company, and a leading engineered fastening systems provider, with unique growth platforms in the Oil & Gas and Infrastructure industries. Innovation has been at their core for 175 years. Stanley Black & Decker is collaborating with the team’s engineers to help develop technologies that will shape the future of racing and transportation. Well-known brands include: STANLEY, CRAFTSMAN, BLACK+DECKER, DEWALT, IRWIN, Lenox, Porter-Cable, Bostitch, Facom, Mac Tools, Proto, Vidmar and Lista. From season five onwards, Envision Virgin Racing will operate independently and will be powered by Audi Sport. The technology agreement will see the team supplied with Audi’s season five cars, the Audi e-tron FE05. As the reigning teams’ champion the package offered by Audi Sport is one of the strongest available. Since its inception in 1963, Alpinestars is now the world-leading manufacturer of professional racing products, motorcycling airbag protection, high-performance apparel and technical footwear. The Italian-formed company is involved across the highest-level motorsport championships including Formula 1, NASCAR, World Motocross, MotoGP and Formula E, and has led to the creation of the most advanced technical equipment for the world racing’s top athletes. The company employs near 500 staff worldwide with headquarters in Los Angeles, California, Northern Italy, Tokyo and Southeast Asia headquarters in Bangkok, Thailand. For season five, Alpinestars will supply the race suits for the Envision Virgin Racing Formula E Team. Erreà is an Italian company specialising in the manufacture of technical sportswear, and represents an international business operating in 80 countries around the world. Founded in 1988, Erreà is a leading brand, recognised as being synonymous with quality, expertise and competence in the field of sports. The entire production chain is managed at its headquarters in San Polo di Torrile, in the province of Parma, Italy, along with the development of all the manufacturing stages: from the selection of raw materials to the design of the graphics, from prototype production right up to the shipment of the finished garments. This complete start-to-finish process is the company's real strength, the plus point that sets it above its competitors, making it the only company currently in the European clothing sector still producing teamwear. This combination of quality and service has led Erreà to become official technical sponsor of some of the most important and well-known Italian and international sports clubs, a highly reputable partner and a point of reference over time for professionalism and experience. ChargePoint is the leading electric vehicle (EV) charging network in the world, with charging solutions in every category EV drivers charge, at home, work, around town and on the road. With more than 54,000 independently owned public and semi-public charging spots and thousands of customers (businesses, cities, agencies and service providers), ChargePoint is the only charging technology company on the market that designs, develops and manufactures hardware and software solutions across every use case. Leading EV hardware makers and other partners rely on the ChargePoint network to make charging station details available in mobile apps, online and in navigation systems for popular EVs.